Brightwaters waterfront with Downtown Views! 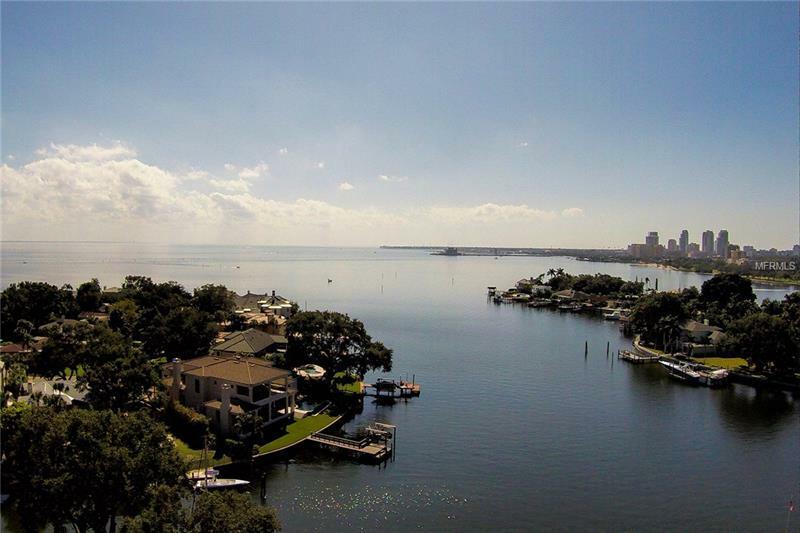 This stunning 3 Bedroom, 3 Â½ Bath, 6132 sq/ft Snell Isle home offers an open concept living space with soaring coffered ceilings and views of open Tampa Bay and the Downtown Skyline. The 2500 sq/ft first level is currently configured as office space and includes a fireplace and mini-kitchen. This generous space could easily be converted into an in-law suite. The second level boasts a grand staircase with custom wrought iron work which leads into an open floor plan area with the kitchen open to the dining and living spaces and French doors opening onto generous outdoor ipe wood decks overlooking the pool area and Tampa Bay. The kitchen features arches, granite counters and a large center island, high end appliances by Thermador and Sub-Zero. The art collector will appreciate the Vantage lighting system throughout the home. The high quality Pella windows and doors offer energy efficient thermal panes. Accessibility is enhanced by the private elevator from the garage to the second level living area. The outdoor spaces are just as elegant as the interior, the grounds are lush and professionally landscaped and the pool is ideal for the competitive swimmer as well as the family. For the boater, there is a dock with boat lift, power and water. All of this is located on Beautiful Snell Isleâs desirable Brightwaters Blvd and an easy drive or bike ride to all that Downtown St. Petersburg has to offer! Copyright © 2019 Mid Florida MLS. All rights reserved. The data relating to real estate for sale on this web site comes in part from the Internet Data Exchange Program of Mid Florida MLS. Information provided is for consumer's personal, non-commercial use and may not be used for any purpose other than to identify prospective properties consumers may be interested in purchasing. RE/MAX Metro participates in the MFRMLS Internet Data Exchange (IDX) program, allowing display of other MFRMLS broker's listings on this site. However may not include all listings currently available. Information is deemed reliable but not guaranteed. Information last updated at 2019-04-20 11:09:17.